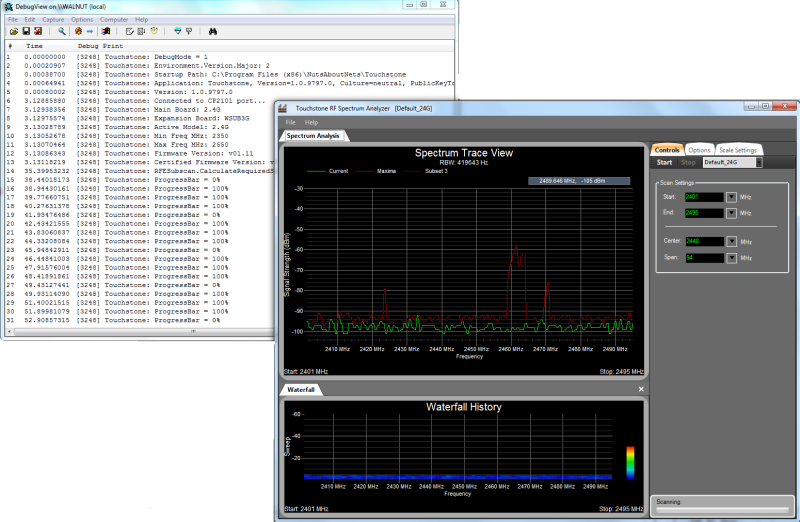 DebugView is an application developed by Microsoft that lets you monitor debug output on your local system. From time-to-time we may ask a customer to use it in order to help track down a problem we can not reproduce on one of our development machines. DebugView is used only for diagnostic purposes and is perfectly safe to run — furthermore, it does not install any driver software. You can download DebugView from Microsoft’s web site. By double-clicking on a LNK file then the Touchstone application will be launched. The different LNK files enable increasingly verbose debug output. 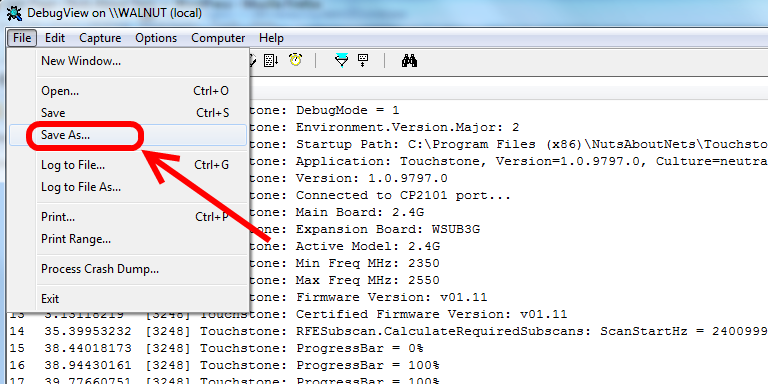 It is safe to run the Touchstone application with debug output enabled. However, since the logging of debug output does impact performance then this should only be used when it is necessary to help us track down the source of a problem. The image below shows DebugView and Touchstone running at the same time. The output lines printed in DebugView’s window are debug messages that originate from the Touchstone application. And, finally, once the debug output has been captured you can save it as a log file (as shown below) and send it as an attachment to us at support@NutsAboutNets.com. We truly appreciate your help in identifying bugs in our software.